FAYETTEVILLE, Ark. 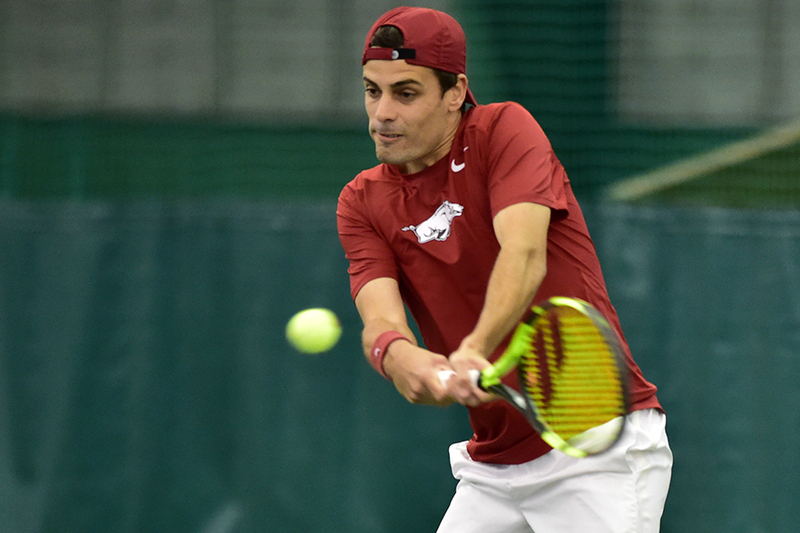 – Led by its lone senior in 25th-ranked Jose Salazar, the Arkansas men’s tennis team defeated the Ole Miss Rebels on Senior Day 4-3. In doubles, Arkansas (13-13, 4-8 SEC) started off with the advantage, as No. 65 Oscar Mesquida and Adam Sanjurjo defeated No. 46 Grey Hamilton and Tim Sandkaulen 6-1 at the top doubles spot. Ole Miss proceeded to take the other two courts to clinch the doubles point and give the Rebels the 1-0 lead. Arkansas would respond in singles, recording three straight two-set wins to take a 3-1 lead. Freshman Josh Howard-Tripp quickly closed out Hamilton 6-2, 6-4, before Salazar defeated No. 30 Sandkaulen 6-3, 6-3 to put Arkansas up 2-1. Salazar improves to a team-best 17-6 mark this spring, including an 8-4 record against ranked competition. The Tenerife, Spain, native has won eight of his last nine matches, including six of the last seven against ranked opponents. Arkansas would get out to a 3-1 lead with a win at the No. 2 spot by Mesquida, who took down Filip Krajevic 7-6 (7-2), 6-2. The Razorbacks clinched the win with a three-set victory by Pedro Alonso on court 5 over Finn Reynolds, defeating the Rebel 6-3, 4-6, 6-1. Following the clinch, Ole Miss was able to get two courts back. Fabian Fallert defeated Sanjurjo in two sets that both went to tiebreakers, as Fallert won 7-6 (7-2), 7-6 (7-5). On the final court, Jose Alonso fell to Cotter Wilson 6-3, 3-6, 6-4. Arkansas will await its seeding in the SEC Tournament that begins on Wednesday, April 25 in Tuscaloosa, Alabama.